Republican Tom Berryhill currently represents Senate District 8 and will not be termed out until 2018. This seat will not be up for election until 2018. Senator Tom Berryhill is a fourth-generation California farmer who has been active in many community groups, business organizations and efforts to improve the quality of life in the Central Valley. He attended California Polytechnic University, San Luis Obispo, and is a strong supporter of California’s public schools and universities. Tom was elected to the Assembly in 2006 where he served on the Assembly Utilities and Commerce and Water, Parks and Wildlife committees, and as Vice Chair of the Assembly Agriculture and Human Services committees. Elected to the Senate in 2010, Tom currently serves on the Committees on Agriculture, Banking and Finance, Business Professions and Economic Development Governmental Organization, Human Services and Budget. He is also a member of Budget Subcommittee 4, which oversees State administration and general government. Having served as Vice Chair of the Rural Caucus and Chair of the Senate Agriculture Committee, Tom has made being a voice for rural California his priority, working to repeal the fire tax, protect both Williamson act and rural public safety funding, and fight for reforms that safeguard taxpayer dollars. As an Assemblyman, Tom was a member of the water bond working group, and in the Senate he continues his work towards solving the water issues facing California. Tom was named the 2013 Senate Small Business Legislator of the Year, the American Nurses Association/California Legislator of the Year for 2008, Friends of California Community Colleges Award for 2008 from California Community Colleges, 2010 Certificate of Recognition from the California Association of County Veteran Service Officers, 2008 Certificate of Excellence from the California Federation of Dog Clubs; 2007, 2008 and 2009 Outstanding Legislator of the Year from the California Sheriffs’ Association, and 2010 Outstanding Legislator from the California Rifle and Pistol Association. In 2012 the California Waterfowl Association recognized him with the Grant Kenyon Award for outstanding advocacy on the behalf of waterfowl, their habitats and hunting heritage. He was also named 2012 Legislator of the Year by Donate Life, California. The Berryhill family has a long history in the Central Valley. Public service, like farming, is a family calling. Senator Berryhill’s father, the late Clare Berryhill, was elected to both houses of the California Legislature and also served the state as director of the California Department of Food and Agriculture. Tom’s brother, Bill Berryhill, served in the State Assembly from 2008-2012. Senator Berryhill represents the citizens of Amador, Calaveras, Fresno, Madera, Mariposa, Mono, Sacramento San Joaquin, Stanislaus and Tuolumne Counties. 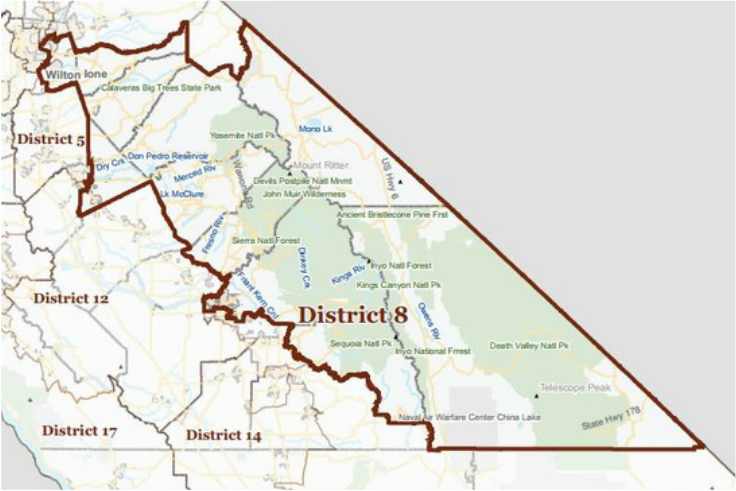 One of the most spectacular districts in the Legislature – the 14th Senate District includes Yosemite National Park, the gorgeous farm lands of the Central Valley, and the spectacular foothills of the Sierra. This region makes some of the nation’s best wine, grows most of its food and produces the milk and cheese millions of people enjoy. Small business is the backbone of the area. Agriculture, wine making, tourism and manufacturing, just a few of the region’s industries, contribute billions of dollars to the state’s economy.